Many items not covered here are addressed at our Discussion Forums. You can also get your questions answered there. Not knowing the proper tip or gratuity for a service can be very unsettling. The rest of your party might not know it, but inside you may feel highly stressed as you walk up to the coat check or curbside check-in. The challenge is not everyday situations, but when you are taken out of your normal environment. For example, if you travel only occasionally, hotel tipping etiquette can be a real mystery. Let FindaLink.net help take the mystery out of tipping etiquette. This brief guide covers most tipping opportunities. If you find yourself in a situation not covered, please use our feedback page to get your questions answered. You may also post your question at our Tipping Etiquette Discussion Forums. Remember that tipping is discretionary. If you don't think tipping is necessary in a particular circumstance, then don't tip. This is a guide for people who are planning to tip and want to know the customary amount. If you think tipping in general is stupid, then don't tip. But don't complain that the minimum wage is too low. Don't complain that the only new jobs being created are low income. And don't send me an email rant about tipping. I won't even respond. See also: email etiquette. This is a guide. It is not implying a moral obligation to tip. That said, if you are using a service that is widely-known to be a tipped service, such as restaurants, bars, hair salons, valet parking, etc., then I believe there is a moral obligation to tip for good service. Here is why - a waiter at a restaurant provides you service with the expectation of being compensated a minimum of 15% for quality service. If you don't intend to tip, then you should tell the waiter up front so that he can decide whether or not to provide you the service. Have you had a hard day traveling or at work? Do you feel a little grumpy? Were you sharp with someone? Well, guess what! People in service industries don't always have great days either. Show them a little mercy and assume the best about them. Maybe your waiter is a little absent-minded because his mother is sick in the hospital. Instead of skipping the tip, talk to the manager about poor service. This is a common question. Custom says that tips are calculated pre-tax, but many people just use the total bill either for the sake of simplicity or to be more generous. In other words, either way is fine. If you are in a situation where the tip is automatically added in, it should be pre-tax. If you received a coupon or gift certificate, how do you calculate the tip? Tipping is always based upon the normal price of the good or service. If you get a coupon for 20% off, then tip on the original price. The amount of work done by the server is not less because you paid less. If you have a coupon for a free entree, then tip based upon the regular price of the entree. Many gift certificates today act more like a debit card. A $50 card is the equivalent to $50 cash, but it can only be used at the named store or restaurant. In that case, you can use the card to pay for the tip as well as the food or service. If you have a gift certificate for a free meal or spa treatment, call the manager before you go and ask if the gratuity is included. If it is not, ask for the estimated value of the gift certificate, and then tip in cash based upon that amount. With proper tipping etiquette, the percentages of your tips do not change because of the cost of the service. Let's take a hair salon, for example. Of course, you can always tip on the lower end of 10-20%. But if you are going to go to a more expensive salon, then it is assumed that you can afford $120 plus tip. If it is really a big crunch for you, then I would recommend going less often or finding a salon that is more within your budget. My wife and I lead a series on financial stewardship, which is basically living within your means. The material that we teach can be obtained at: http://www.crown.org/. There's no shame in figuring out that $132-144 is a bit much for hair. It bothers my wife too, but she has a budget set up for it and does it anyhow. She just spends less on other things like Starbucks. This is the question I get asked most via email - do you tip the owner of a company when he or she provides your service. The answer used to be no. Now it is yes. Apartment building superintendent - $50-200. Tip less if you tip throughout the year. Apartment building handyman - $15-40 each. Apartment building elevator operators - $15-40 each. Apartment Doorman/concierge - $10-80 or more each, depending upon building. The fewer doormen the building has, the more you tip each one. Those who serve you more should get a bigger tip. Au pair - One week's pay, plus a small gift from your child. Baby sitter - One night's pay, plus a small gift from your child. Coaches, tutors, ballet instructors, music teachers - A small gift from your child. Country Club - I believe in tipping at Christmas regardless of the club's tipping policy. I recommend a minimum of $50 for your waiters, locker-room personnel, front-desk employees, and golf professionals. For head waiters or special service, make it $100. Day care service - $25-70, plus a small gift from your child. Dog groomer - 1/4 - 1/2 cost of a session. Dog walker or sitter - 1-2 week's pay. Full-time nanny - One week's to one month's pay based on tenure, plus a small gift from your child. Garbage collector(s) - $15-30 each. Nowadays, most garbage collectors are really truck drivers. The truck has an arm that does all the work. If this is your situation, there is no need to tip. Maid - one week's pay. This is for maids in your employ whom you pay directly. If you use a service and never know who is coming out, don't tip at all. Massage therapist - $15 or more. Read more about tipping massage therapists at www.frappydoo.com. Personal trainer - $60-100 upon reaching goal. Teacher - $25-100. Give a gift certificate to a bookstore or office supply store. If you know the teacher's hobbies or interests, then a gift certificate would be nice from the local movie theater, hobby shop, mall, fine restaurant or day spa. Some teachers might feel uncomfortable receiving gifts around grade time. If you are unsure, ask your principal first. UPS, Fedex or Overnight Delivery - Regular driver - $10-30. USPS Mail carrier - Non-cash gifts with value up to $20. This is for mail carriers that you know and see regularly. Read more below. There are rules regarding gifts for USPS mail carriers. I'll quote them from the a USPS article. While many Postal Service™ customers have traditionally thanked their mail carrier with gifts of cash during the holiday season, this practice puts our employees at risk of violating federal law. The Standards of Ethical Conduct for Employees of the Executive Branch ("Standards"), specifies that Postal Service employees may not accept gifts from outside sources (including Postal Service customers) or gifts given to them because of their official positions. Postal Service employees are also prohibited from soliciting gifts from outside sources. Snacks and beverages that are not offered as part of a meal. Items with little intrinsic value (i.e., greeting cards, plaques, pens, coffee mugs, etc.). Perishable items (i.e., flowers, chocolates, cookies, etc. ); if the items are clearly worth more than $20, employees should share them with others in the Postal Service workplace. Items with a market (retail) value of $20 or less. Gifts motivated solely because of a personal relationship. Gifts for which the employee has paid market (retail) value. Gifts paid for by the Postal Service. Postal Service employees may not accept cash - in any amount or form (bills, checks, money orders) - from an outside source. For further information, please contact the U.S. Postal Service® Law Department's Ethics Helpline at 202-268-6346, or send an email message to ethics.help@usps.gov . Charter pilot - Nothing. It is not necessary to tip pilots unless they provide extra services. Then it is whatever you deem appropriate for the service. Electric cart driver - $2-$3 a person. Flight attendant or other in-flight personnel - Nothing . Porter or skycap - $2 per bag or more if the bags are heavy. $2 extra for curbside check-in is optional. If you arrive late and he helps you get to your flight on time, tip an extra $5-20. Wheelchair pusher - If they are just pushing you down the ramp from the gate to the plane (or in reverse), then nothing. If it is from the ticket counter to the gate/plane or from the gate/plane to the luggage carousel, then $5 is appropriate. Tip more if they help you with your luggage ($1-2 per bag) or if they help you to your car. If they are pushing you from one terminal to another (long distances), then $10-20 would be appropriate plus extra for luggage. Tip less if they are unpleasant or rude. Tipping on trains can be very confusing because most people don't travel by train often and the situations can be confusing. For instance, sometimes the meal is included, sometimes it isn't. Auto dealership shuttle driver - Nothing. Courtesy shuttle driver - $1-$2 per bag if he helps with the bags. Taxi, limo, paid shuttle, or van driver - 15% of the total fare. Up to 20% if the driver helps with the bags or makes extra stops. No less than $1. If someone else is picking up the tab, they are responsible for tipping also. Be careful, the rate quoted for limos often includes gratuity. Bath Butler - 15-20%. Bath butlers are not very common. They draw a luxurious bath for you with your choice of available options such as champagne, candles, chocolates, aromatic salts, rose petals, music, etc. Bellman - When he helps you with your bags, tip $1-2 per bag. Give him the tip when he shows you your room. If he just carries the bags to the front desk and then disappears, save it for the person who carries the bags to your room. Upon checkout, tip a bellman who helps with your bags. Tip more for additional services. Butler - $5-10 per service or $50-100 per night. Very special services like meals when the restaurant is closed are more like $50. Concierge - $5-10 for help with hard-to-get dinner reservations or theater tickets. Tipping is optional for just plain advice, but $5 is the minimum. Tipping can be done at the end of the trip or at the time of service, just keep is straight so that you are fair. Delivery of special items - If you request extra pillows or an iron, tip $1 per item received, minimum $2. Doorman - If he hails you a cab, $1-2. If he helps you with your bags in or out of the car, $1 a bag. Use $1-2 per bag if he carries them all the way to the room. If he just opens the door, nothing. If he is helpful with directions or restaurant recommendations, $5. Front Desk - Typically there is no tip for the front desk, but if they help you with early check-in or late check-out, tip $1-2. Maid service - $3-5 per day typically, up to $10 per day depending upon how much mess you make. Tip daily because there might be a different maid each day. Leave the tip on your pillow. Err on the side of being generous, and tip on the last day also. If they change out your linens by request, give $1-2 each time. Maintenance staff or Technology Engineer - Nothing to replace a light bulb, fix the air conditioning, internet access, etc. If they teach you how to do something on your computer that is not a responsibility of the hotel like burning a CD, then tip $10-20. Personal Shopper - Personal shoppers don't typically work for the hotel. 10% of the total purchases is appropriate. You can also have the hotel send them a gift of jewelry or wine. Recommending their services to others is a great tip. Room Service - If gratuity is included, add nothing or $1. Otherwise add 15-20% to the total charge. Spa Technician - Most hotels automatically include an 18% service charge in the bill. If it is not included, tip 18%. If the service is provided in your room, the hotel will typically add a separate fee of $25-40 to your treatment - the 18% tip is on the new total. Ski Valet - $2-5 per person, per day. A ski valet helps with rentals, stores shoes and provides dry boots each day, and stores your gear at the end of the day. They also provide trail maps, ski lift times, rides to the lift, etc. If he serves as a guide on special trails, tip an extra $50. Swimming pool or gym attendant - Nothing, unless you require special services such as extra seating or inflating pool toys; then it is $2-5. If you want the same deck chairs every day, then tip $2-3 per chair beginning the first day. Tanning Butler - $5-10 per lotion application. Valet or parking attendant - $2-3 is appropriate for bringing the car to you. It is not necessary to tip for parking, but always for returning the car. Many, if not most B&Bs have a no-tipping policy in the US and Canada. In other countries it varies. It never hurts to tip, but it is definitely not expected, and many B&Bs specifically ask that you do not. Most are family owned and the price they charge covers everything. The safest bet is to inquire at the specific Bed and Breakfast where you plan to stay before you arrive. If there is hired housekeeping staff, then tip the same as at a hotel. Check ahead. If the tip is not already included, give 10-15% of the tour price. No less than $1-2 for a half-day tour, $3-4 for a full-day tour, and $5-10 for a week-long tour. This is a per-person rate. Tip private tour guides more. If the bus driver is particularly helpful with bags, then tip $1-2 per bag. Boat trip - If the trip is over 3 hours, tip $10-$75 depending upon the cost of the excursion and the quality of service. Outdoor guides (fly fishing, horseback riding, river rafting, etc.) - 15% of the cost of the service. Some companies have a no-tipping policy. Check when you book the trip. Private Yacht Charter - Tip the crew 10-20% of the charter fee based upon the quality of service. Hand the gratuity to the Captain for distribution to the crew. Many cruise ships have a no-tipping policy. Find out in advance. If you are supposed to tip, find out if it is done at the end of the trip or at the time of service. Oftentimes, at the end of the cruise you are provided envelopes with suggested tip amounts. If you are supposed to tip, budget about $20 per day. Bar steward - Usually, 15% is automatically added to bill. Bus boy - $1.5 per day per person. Cabin steward - $3 per day per person. Maitre d' - Not necessary unless special services provided. Waiter - $3 per day per person. Please don't get hung up on the 12%. It is just a reasonable example. I recommend tipping 10-15% on the alcohol and 15-20% on the food. 10% on the wine is perfectly acceptable. Whether to tip 10 or 15 percent would depend in large part on how helpful the server was in choosing the wine and serving it. Teppanyaki chef - 15-20% of the total bill. The gratuity will be split among the wait staff and the chef. Wine steward or sommelier - 15% of wine bill. If you hold a table for two serving periods, make sure that you tip double. In other words, if you spend enough time at a table that a waiter could have typically gotten two parties seated and served, then compensate him for his time by tipping him twice. I like to ease his mind by telling him this about half-way through. Electrologist, laser hair removal - Nothing. Hair Extensions - 10-20%, regardless of the cost of the service. Hair Stylist or Color Specialist - 10-20%. $3-5 extra for last-minute service. Shampoo or other assistant - $2-5 for each person. Hand the tip directly to the person providing the service. Massage therapist - No tip if at doctor's office. 10-15% otherwise. If they come to your home or hotel room, find out in advance whether a tip is included in the price. Salon or spa package - Determine in advance whether a service charge is included. If none is included, then 15-20% split among the service providers. You can ask for it to be divided, pay each person at the time of service, or leave it in envelopes available at the front desk. If the salon messed up your service, and you return for a re-do, do not tip again. Owner who provides any of the above services - Follow the rules above. The location of the service provider is irrelevant in determining the tip. It doesn't matter if they work in a salon, rent their space, or work out of their home. At many golf or country clubs, tips are included in your monthly bill. 57% of country clubs have a no tipping policy. It is worthwhile to look it up or check with your club first. Bag guy - $1-2 per bag. Beverage cart girls - 15%, minimum of $1-2. Round it. Golf caddies - $15-25 per person above any fee for the caddy. Golf or tennis pro lessons - Nothing. Large errands - $10-20. For concierge-type services of ordering flowers, obtaining hard-to-get theater tickets, etc. Restaurants - same as at any other restaurant. See above. Small errands - $5. What's a small errand? Running to the store, sending a fax, calling a cab. Shoe shine - $2 per pair. Many contracted services for weddings include tips in the final bill. Make sure you read your contract carefully so that you are not double tipping. As always, if you receive service above and beyond what you expected, extra tipping is recommended. Catering hall wedding coordinator - $50 for the coordinator, and something less for the assistant ($25). Make sure it is not included in the price of the event. Coat check - 50 cents per guest. Limo driver - 15% of the total fare. Make sure the tip is not included already in the bill. Minister, priest, rabbi - Minimum of $100, more if travel involved. Give the gratuity to the best man who will in turn give it to the officiant following the ceremony. Open bar at receptions - There are two views on this. Some say tip $1 for each visit to the bar. Other's contend that the tax and tip are included in the cost of the open bar, and that the guest should only tip if it is a cash bar. I lean toward the latter view, but it never hurts to be generous. If you are the host of the event, make sure it is not included. If it is not included, the tip is 15-20%. Reception Musicians or DJs - Only necessary when service is beyond expectations, up to 15% or $25-50 per person. Wedding organist, musician or soloist - First check whether or not the gratuity is included in the rental of the church. If not, $50 per person or $75 per person for close friends. How much of the service does the clergyman perform, and does it include a graveside service? How many ministers are speaking at the service. How well do you know the minister? How good of a job does he do? What is customary for the area? When my daughter died, I had two ministers from my church perform the services. One spoke for the memorial service, and the other did the graveside. Both refused the honorarium. When this happens, wait a couple of months and do something special for him. Be sure to send a thank you card regardless. If you are still not sure how much to give, then ask for some help from the funeral director. He will know what is customary. You do not tip a funeral director. Tipping Caterers can be a real mystery. The best thing to do is to talk to the caterer in advance. Most caterers have a service charge that is included in the bill and is distributed to the cooks, driver and wait staff. If there is no service charge or it is not for the people doing the work, then tipping 15% of the entire bill is appropriate. This amount should be divided among the servers by the on-site manager. If it is included, you don't need to tip any more. Of course, if someone really goes out of his way for you, then feel free to tip that individual extra, remembering that it will be extra. There are many things to consider in a move. A professional mover is going to be careful to protect your floors, walls, doorways, and belongings. That said, it is unlikely that your move will go perfectly, whether you are moving yourself or paying someone else to do it. Something will get broken. The question that matters is were they being careless, or was it a genuine accident? Every time I have moved furniture myself, I have caused more damage to my home than movers ever had. I take this into consideration when I look at accidents. Tipping occurs at the completion of the job. Consider providing lunch if the move extends over lunch, and always provide beverages for the movers. One mover - difficult move - The degree of difficulty changes based upon stairs, narrow passages, small elevators, large or heavy items, appliances, etc. - $20-50. Multiple movers - Basically tip each mover the same as above, but lower it by $5-10 for each mover. Feel free to pool the tip and give it to the supervisor for distribution, but don't lower the amount because you combined it. The problem with combining the tip is that you cannot reward people based upon their individual performances. Consider the level of danger. Tip an additional amount if it is roadside service versus in a parking lot. Towing service - $5 - $20 depending upon circumstances and your desperation. Appliance repairman - Nothing. Offer a cool drink instead. Auto mechanic - Not necessary. If you insist, tip about $10-20 for bills up to $500, and $50 for bills over $500. Bagger at grocery store - Check in advance to see if the store has a no tipping policy. Most have one. If it doesn't, then $1-3 for the bagger and $1-5 for the person who loads your car. Car wash - $2-3 for a car; $3-5 for an SUV or large vehicle. If there is a tip jar, leave your tip there. It will be split among the workers. Otherwise, tip the person(s) who did the cleanup after the wash. Carpet cleaners - Nothing. Offer a cool drink instead. Casino party dealers - $25-50 per dealer. Clown at children's party - $15-25 depending upon the quality of the performance and the heat level of the day. Others say 15-20% of the performers fee. Computer technician or consultant - Nothing. Contractors, installers, and home remodelers - Nothing. Offer a cool drink instead. Cosmetologist at makeup counter - Nothing. Makeover specialist at department store - Nothing unless you used over 15 minutes of her time and then bought nothing. Electricians and plumbers - Nothing. Offer a cool drink instead. Exotic club - Nothing. Shame on you. I can't believe you would even ask. Farriers or horse haulers- Nothing. Handyman - Nothing. Offer a cool drink instead. Maids - Nothing, except at Christmastime. See above. Mary Kay representative - Nothing. Mortgage loan officer - Nothing. Painters (house) - Nothing. Offer them a cool drink instead. Personal shopper or salesperson at department store - Nothing. Pet groomers - Most pet groomers are paid based upon a commission, not a regular salary or hourly wage. Typically your tip is 15% of the bill or $2 per dog, whichever is greater. If your dog is difficult, then tip more. Obviously, don't tip if the quality is poor. Pet sitters - Tipping is not required, but most pet sitters will appreciate a tip. 15% is appropriate if you want to tip. Realtors® or real estate agents - Nothing. The best way to say thanks is to refer people to them. Sports arena in-seat food service - This one is tricky. At most arenas you tip the person who takes the order 15%. You tip at the time of payment, not delivery. The best thing to do is to ask before you order. You definitely do not need to tip both the order taker and the deliverer unless you split it. Swimming lesson instructor - Nothing. Tailor or seamstress - Nothing. Tattoo or piercing artist - 10-20% or whatever you can afford. It isn't necessary, but it is appreciated. Telephone, security, cable, satellite, internet installers or repairmen - Nothing. Theatre Ushers (Broadway) - Nothing. If you want to tip for special service, $1-5. Title company closing agents - Nothing. Tree removal service - Nothing. Weekly lawn or landscaping service - Nothing. Window tinting service - Nothing. Big box like a TV to your car - Nothing. Most stores prohibit employees from receiving tips, and the employee may be subject to discipline for doing so. Car Delivery (long distance delivery at purchase) - Most people don't tip. Inspect your car very carefully - the interior and exterior. Then check the mileage. If everything checks out and you would like to tip, then tip $10-20. Dry Cleaning or Laundry Delivery - Nothing. Most services instruct drivers not to accept gratuities. Flower deliveries - $2-5 for normal deliveries and $5-10 for large ones. Furniture or appliance deliveries - $5-10 per person. If the delivery is huge, then $20 per person. Grocery delivery - Usually included in the fee. Newspaper - Nothing except at Christmastime. See above. Pharmacy deliveries - Nothing. If you insist, $2-3 per delivery, not per prescription. Pizza deliveries or other food deliveries - 15%, but not less than $2. If you receive service (clean windshield, check fluid levels, etc. ), the tip varies from $1-5 depending upon how much they do. $1-2 for a good job on the windshield, and $3-5 for windshield and fluid check. If you have to ask the person to do these things or they do a poor job, then I wouldn't tip anything for windshield only or $1-2 for the full whammy. There is one big exception. If the price of gas at the self-service pumps is $1.70 and the price for full-service is $2.50, then they are already charging you for the service. Before we talk about casino tipping, let's discuss a budget. Before you go to a casino, you should determine how much you are willing to lose before you call it quits. Gambling is fine for entertainment, but it is not a good means of wealth accumulation. If the odds weren't in the house's favor, casinos would not make as much money as they do. Gambling without a budget is poor stewardship of your money. I personally recommend against gambling. I know too many people who didn't expect to have a problem but are now addicted to gambling. It can ruin families and finances. Casino workers are a part of the service industry and make 2/3 of their income from tips. 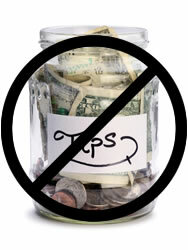 Without tips, they are grossly underpaid. One general rule for tipping at a table is that you tip when you are winning, not losing. Craps or blackjack dealer - $5+ chip per session. If you prefer, you can place a side bet for the dealer up to 10%. The size depends upon the table's minimum bet; however, it need not ever exceed $25. At a $5 table, the tip would be a $1 chip. At a $25 table, use a $5 chip. Drinks waiter - $1+ chip per drink. Remember that you are getting free drinks because alcohol lowers your inhibitions and you will gamble more. Keno writers/runners - $1+ for first ticket. If you play a lot, tip more. 5% if you win. Poker dealers - $5+ chip per session. You may tip 10% of your winnings, but not to exceed $25. Roulette dealers - $5+ chip per session. Slot machine attendants - $1-2 chip when they repair your machine. Slot machine changers - These guys are pretty much obsolete because most machines today spit out paper receipts of winnings. If you do have a machine that pays in coins, tip $1+ chip per change, plus 5% on a jackpot, not to exceed $25. They're showing up everywhere -- tip jars. Most people hate them. Where is it appropriate to leave a tip in a tip jar? We'll cover some of the basics. Any fast-food restaurant - Nothing. Buffet-lines or cafeterias - Nothing. If there is a person who comes around and keeps your tea glass full, tip him personally $1-2. Donut, bagel or coffee shop - Nothing. Sports arena concession stands - Nothing. If you get the idea that tip jars are out of place at any food-service establishment that does not actually bring the food to your table and keep your drinks refilled, then you are correct. If you want to tip at Starbucks, go for it. Just don't email me about it. I've heard every argument there is, and my advice, which is just that - advice, isn't changing.